Ron Rickard, sole central agent at Ardell, advises us of the latest, $2 million price reduction for the fishing expedition superyacht, Garfield. 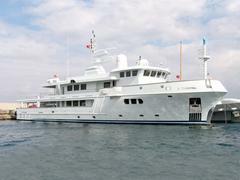 Lying in Marmaris, Turkey, the new asking price for the 132ft Dearsan is $6.95 million. With just 500 hours on the twin 840hp Caterpillar engines, Garfield is fully maintained by a permanent crew. “Keeping the boat in excellent condition is an expensive business and the owners have decided they really want to sell her,” says Rickard.